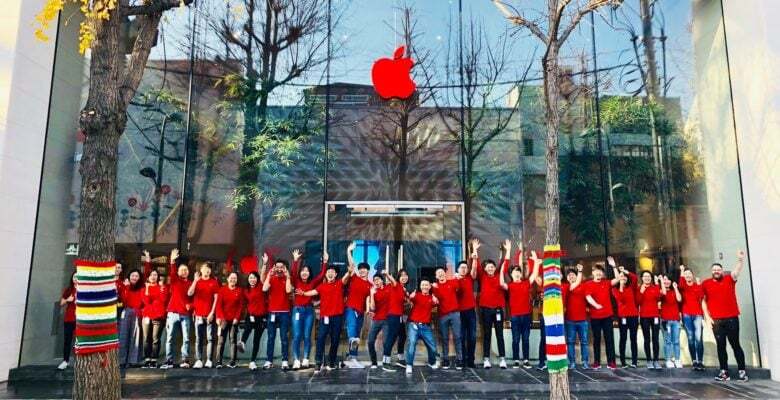 Apple calls attention to World AIDS Day with red logos in its retail stores. Apple is a company with a social conscience, and it’s using its high profile to bring attention to the fight against HIV/AIDS. As part of this, Apple logos at its retail locations around the word went red to observe World AIDS Day. But that’s just the start. From today through Dec. 7, checking out with Apple Pay in the Apple Store will donate $1 to fighting this epidemic. The donations go to (RED), which is a major supporter of the Global Fund to Fight AIDS, Tuberculosis and Malaria. In addition, multiple articles were added to App Store today about the struggle against HIV/AIDS. One of these points out that, in sub-Saharan Africa, life-saving antiretrovirals (ARVs) cost as little as 20 cents a day. So a $1 donation realty does make a difference. Even after Dec. 7, those who would like their purchases to contribute to solving this problem can buy items from Apple’s Product(RED) offerings. This includes special versions of the iPhone XR, Beats headphones, cases and Apple Watch bands. These are all red, of course, and buying one sends a donation to (RED), the Global Fund, and AIDS treatment and prevention.